Ask or tell us about the Stirling name, and we'll add the information to this page. The surname 'Stirling' comes from the town in central Scotland, which was earlier known as Strevelin (probably the river name). The name Gilbertus de Struelin is recorded in 1136, with this surname appearing in records until the end of the 14th century. It then is used widely in its present form, particularly in Edinburgh and Glasgow. The Stirling name is recorded in Nairn from an early date. The Stirlings of Keir (in Stirlingshire) have held their lands from 1160. 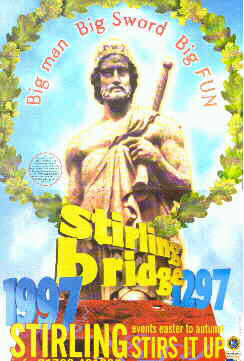 The town of Stirling was the setting for the Stirling 700 events in 1997 (see the poster on the left below), including the Braveheart Convention, to mark the 700th anniversary of the Battle of Stirling Bridge (as depicted in Braveheart below). 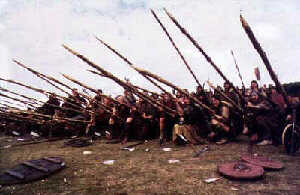 The decisive Battle of Bannockburn (as shown in the final scene of Braveheart) was fought near Stirling in 1314. My Name is Barney M. Stirling I live in British Columbia Canada. I was wondering if you could tell me about my last name? I see lots of references to Stirling in Scotland, can you please tell me more about it?